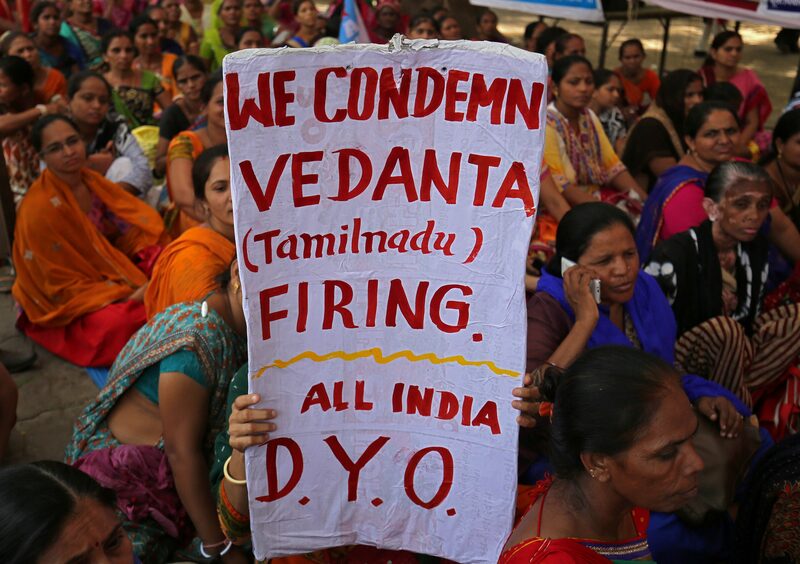 A protest, organised by All India Democratic Youth Organisation, after at least 10 people were killed when police fired on protesters seeking closure of a Vedanta plant on environmental grounds in Thoothukudi in he southern state of Tamil Nadu, in Ahmedabad. Vedanta Resources said on July 2 that the family trust of Chairman Anil Agarwal had made an initial offer to buy out the 33.5 percent of shares of the company that it doesn’t already own, valuing the London-listed mining group at 2.3 billion pounds ($3.03 billion). The offer of 825 pence per share in cash is a 27.6 percent premium to the company’s closing price on Friday. Shareholders will also be entitled to receive a previously announced dividend of 41 cents per share, the company said, adding that this would boost the value of the offer to 856 pence per share. An independent committee of Vedanta’s board formed to review and evaluate the proposal indicated it would recommend a firm offer. Volcan, Agarwal’s family trust, would expect to include a 90 percent acceptance condition as part of its offer, Vedanta added. Vedanta Resources owns just over 50 percent of Mumbai-listed Vedanta Limited, which has a market capitalisation of almost $13 billion. Shares in Vedanta Resources were up 27 percent at 822 pence per share by 0830 GMT on July 2. Shares in Vedanta Limited fell more than 2 percent to 230 rupees per share by 0715 GMT.